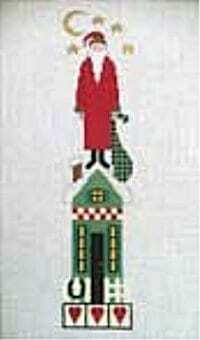 A hand painted canvas from The Artist’s Collection’s Heartstrings Pat Thode design that comes with a stitch guide suggesting threads and stitches that could be used on this Santa standing on a house with snow on the roof and three hearts at the bottom. A gold crescent moon and stars are in the sky over his head . He holds a plaid sack of gifts in his hand. A brass snowflake and star charm are included.